Some of us are natural born adaptive. They don't lose their cool when life hurls a storm at them—they weather it out. 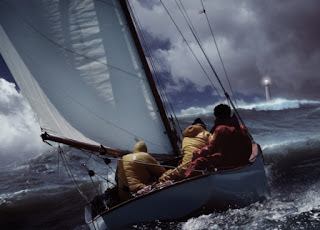 Like skillful sailors, they are able to quickly adjust their sails in the direction of the wind and sail along unperturbed —while some readily succumb at the mere sight of the waves. They resist change. Adapt to win, not to succumb. You see, the real challenge to dealing with our hardships and struggles adequately is for each of us to stay firmly on track even as life shifts constantly. To sway with the shaking yet remain grounded. To never compromise, but to hold firmly to one's ideals and values amid the dictates of today's popular culture. Adapt to cope, not to yield. The world is changing too fast. Our cultures, our lifestyles, our values…everything seem to be moving at breakneck speed like never before. To thrive and survive, we need to be flexible yet uncompromising with our moral and ethical standards. Because it is no longer the case for choosing between black and white these days—being in the "gray" has become more acceptable. And it's so easy to yield. Don't. Adapt to learn, not to be gullible. Often, we can overcome our difficulties and hardships in life if we're just open-minded enough to see them from different perspectives. Because what we may see as a black-hole from one point of view, could be an escape tunnel from another vantage point. But, be discerningly perceptive. Sift thru the clutter. Adapt to survive, not to cave in. Remember the famous English proverb, "a smooth sea never made a skilled sailor"? It rings true in life. We just need to realize that our present circumstances are meant to toughen us up, and not to destroy us. To teach us to master our storms, not the other way around. Because if we don't, they will toss us around. Sure, size up the waves, but then ride them over. Adapt to let go, not to let loose. Really, it's okay to be vulnerable sometimes. Almost necessary. And just because you have to yield emotionlly at times, doesn't mean you are weak. Quite the opposite. It takes inner strength to accept the unpleasant together with the pleasant. Or to live with them. Because sometimes it is better to let go of things we do not have control over anymore. But, that doesn't have to mean we let loose and get out of control. Rather, it is having to face life with grace under pressure. Sir Winston Churchill once wisely quipped: "in war as in life, it is often necessary when some cherished scheme has failed, to take up the best alternative open, and if so, it is folly not to work for it with all your might." And to that, I absolutely agree. Do you?